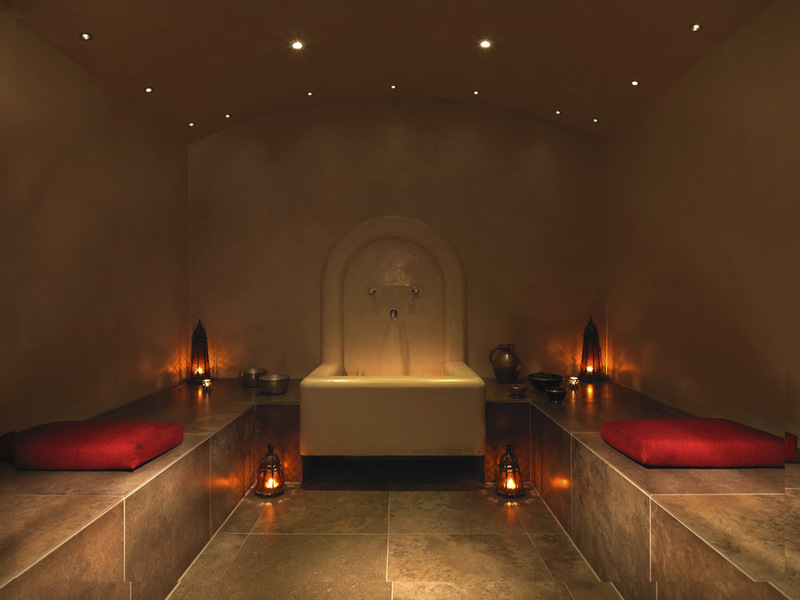 Can you think of a better way to spend a cold and miserable week than in a comatose state of zen, wrapping up in fluffy bathrobes and experiencing a soothing and comforting couples spa treatment, all tucked away inside one of London’s most serene places, deep underground far away from the rest of the world? Nope, neither can we! On a cold and grey morning we ventured into central London to find The Spa in Dolphin Square in Pimlico. Although just a short walk from Pimlico tube, the spa was a little difficult to find as it was through a number of doors in the leisure centre and apartments of Dolphin square, we passed a bar and restaurant, cafe, shop and swimming pool and were then directed down some steps, but once I stepped inside it was like stepping into Morocco! 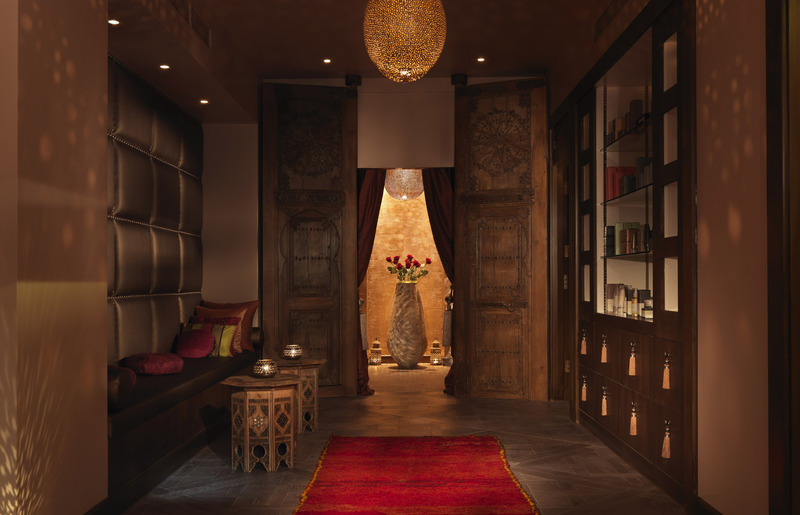 Okay, so who cares if we’ve not actually been to Morocco (yet), but we imagine it’s a lot like The Spa at Dolphin Square! Beautifully designed in the style of a Moroccan hammam, the spa features ornate lighting and rich colours, small Moroccan tables, pretty lanterns, trellised screens, candle lit nooks filled with cushions, wispy curtains and ambient exotic music, a colour scheme of luxurious gold, burnt red and dusky oranges, and ornate mahogany doors that transported us to somewhere deep in the Atlas Mountains. 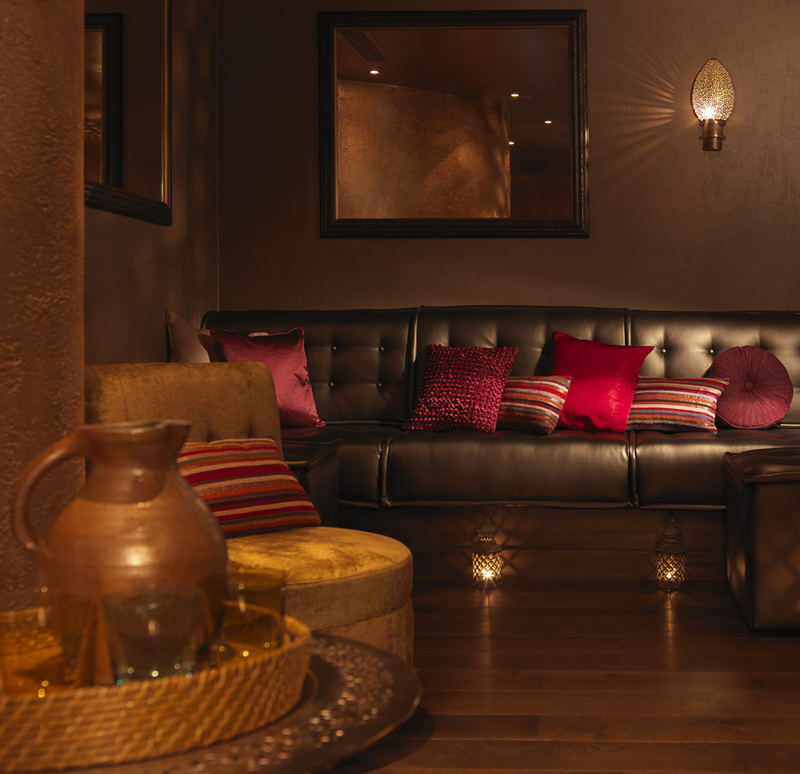 A warm welcome, delicious incense and fragrances and the authentic Moroccan décor create a true Moroccan oasis, a world away from the hectic city life of London. Once we’d filled in the medical questionnaire we were given a tour of the facilities, and provided with lockers, robes and flip flops. Our therapist invited us into the dimly-lit, warm hammam chamber to start our luxury hammam treatment. She was full of information about every stage of the process. In Morocco, the hammam is a cleansing ritual – friends or family go frequently for a deep clean. The couples spa treatment started with a mint leaf foot soak, whilst we sat on the warm stone bench in the white marbled, dimly lit Moroccan Hamman. Then she poured warm water all over our bodies. Next, she started massaging a special soap made from crushed olives, olive oil and eucalyptus into our skin. She then left the room while the soap worked its magic. She returned a little while later to rinse it off with more bowls of water, and then scrubbed us tip to toe using an exfoliating Kessa glove. The ritual lasts around 25 minutes. All squeaky clean, we popped into the salt-infused steam room for a few minutes. We were surprised at how salty the air really was! Then we were finally ready for the clay treatment in the Rhassoul room. This wasn’t so much of a room as it was a whole suite – a corridor with a bench where you can sit and apply the nourishing clay (the clay is from the Atlas mountains and it’s meant to detoxify and nourish your body), then walk into a large private steam room with two mosaic chairs opposite each other where you can sit and relax together and let the clay soak into you. After 15 minutes (if you can last that long!) you can rinse it all off – there’s a cold shower inside the steam room which is very refreshing, and there’s also a separate two persons shower as part of the suite (a helping hand from your partner is recommended). We put our robes back on and were led to the tepidarium where we lay down on the heated beds, relaxing in the warmth. A few minutes later we were presented with a fresh mint Moroccan tea with sweet dates. After a couple of hours at The Spa in Dolphin Square, it was time to leave the safety of this Moroccan hideaway, feeling very very zen. It’s a great place to while away an afternoon away and the perfect retreat for couples wanting to spend some time together whilst enjoying an indulgent couples spa treatment.